Great Professor or TA? Nominate Them! Have you had a great professor or outstanding teaching assistant while studying at Laurier? Have you considered nominating them for a teaching award? The Faculty of Arts Teaching Scholar Award recognizes the teaching excellence of Laurier’s Arts faculty members. The Teaching Scholar Award will honour a faculty member who explicitly and creatively integrates the twin functions of scholarly research and teaching. Nominations should be submitted to the dean of arts by Nov. 30, 2016. For information on award criteria and how to nominate a professor for this award, email the Dean of Arts Office. This award has two categories: one for undergraduate students and one for graduate students. 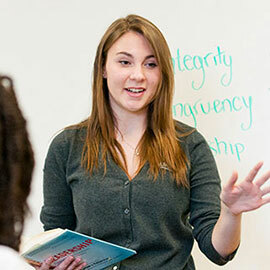 The successful nominee is a person who creates outstanding learning experiences for students at Laurier by implementing intentional and thoughtful teaching approaches. These approaches could include leading tutorials and seminars, lab demonstrations, teaching in a one-on-one setting, mentoring and/or coaching others, and providing student feedback. For 2016, the nomination period will open on Nov. 1, 2016 and close on Jan. 13, 2017. Nominations for the Laurier Student Teaching Award of Excellence can be started online. The Wilfrid Laurier University Award for Teaching Excellence honours full-time and part-time faculty and lab instructors who, through their commitment to teaching innovation and excellence, make significant contributions to the educational experience of Laurier students. Nomination packages should be forwarded to faculty/school deans for endorsement and a letter of support by Jan. 15, 2017, and by email to the Centre for Teaching Innovation and Excellence (CTIE) by Feb. 1, 2017. For a nomination package, and to learn about the four award categories and award criteria, email CTIE. The Faculty of Science Award for Teaching Excellence recognizes science faculty who have demonstrated excellence in teaching and demonstrated a commitment to student learning at Laurier. Up to two awards are granted each year: one for early-career faculty, and one for established faculty. Nominations should be submitted by March 13, 2017. For information on award criteria and how to nominate a professor for this award, email the associate dean: priorities and planning. The Hoffman-Little Award is presented by the Wilfrid Laurier University Alumni Association to a Laurier faculty member in recognition of excellence in teaching, research and professional endeavour. The winner will be distinguished by his or her rapport with, and service to, students, contributions to the community at large, previous awards and honours, service to colleagues in the academic community, and as inspiration to students, staff, and fellow faculty. Nominations for the Hoffman-Little Award are due by early 2017. The Faculty Mentoring Award is presented annually by the Wilfrid Laurier University Alumni Association to a Laurier faculty member in recognition of their outstanding mentorship and support to undergraduate and/or graduate students while the students are completing independent research. The recipient will have provided significant, positive mentoring to encourage and support students engaged in research. The recipient will have been a faculty member at Laurier for a minimum of three years and will have a track record of strong mentorship to a number of students over the years. Nominations for the Faculty Mentoring Award are due by early 2017.